I’ve been very slack on the news front because of various commitments, the most significant of which is completing my dissertation. However, I did want to mention that almost six years after receiving a National Interest Waiver green card (on the basis that because of my work as a folklorist/radio producer with a special focus on traditional culture around the USA, it was in the national interest to have me Stateside), I became a naturalised US citizen (and therefore a dual national – British American). 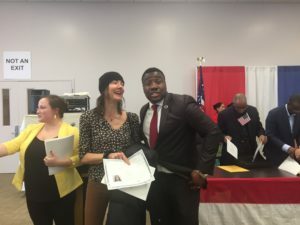 The ceremony took place at the Franklin Board of Elections in Columbus, Ohio, and the first thing I did on being granted this new status was register to vote!